Frontier City in Oklahoma combines modern day thrills and amusements with the feel of an Old West town. You can watch gunfights, sing along to country tunes and drink at wild west-style saloons. So what are you waiting for? Come to Frontier City and find your inner cowboy. Located in Oklahoma City, Frontier City is the largest theme park in Oklahoma. The park opened in 1958 at the Oklahoma State Fairgrounds, and then moved to its current location where it quickly grew in popularity due to the closing of Delmar Gardens and Springlake Amusement Park. As with everything at Frontier City, the rides and attractions are decidedly western, from the names to the landscaping to the themed props. Eruption: Thrill-seekers will love how Eruption slings guests up almost 250 feet, and then back to earth again in a giant bungee corded ride. Silver Bullet: This steel coaster sends riders hurtling at speeds of 45 miles per hour and a height of 80 feet. Mindbender: Guests will experience a dizzying delight on this 51-foot high roller coaster. Wildcat: This old-fashioned wooden coaster produces plenty of thrills, including a top speed of 46 miles per hour, a height of 75 feet, and an initial drop of 65 feet. Renegade Rapids: Beat the heat with this wild rapids ride for the whole family. Quick Draw: This fun interactive game lets guests shoot the bad guys and save the day! Points are tallied on each individual ride so you can judge if you're a sharpshooter or not. Diamond Back: The thrill in this coaster isn't the quick-paced steel coaster ride; it's the reverse ride back to the start. Mystery River Log Flume: A mainstay of any amusement park, the log flume never fails to disappoint theme park lovers. O.K. Kids Corral: Kids will have a ball at this two-story attraction filled with pint-sized fun. Wild West Waterworks: Frontier City's latest attraction, the Waterworks' activity structure claims to have 198 ways to get wet, including 8 slides and a 1,000-gallon tipping bucket. Additionally, family favorites such as the carousel, bumper cars, swing ride, pirate ship and Ferris wheel will please park guests with their simple, classic pleasures. 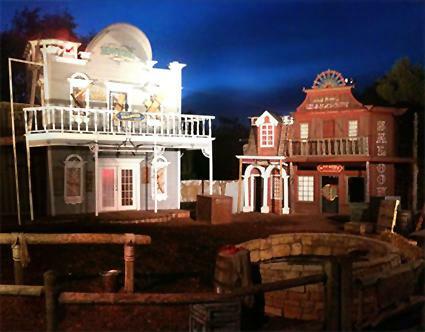 The Wild West Gunfighter Show: You can watch Cowboys perform wild west gunfights in the park's opera house. Who will be the last man standing? World of Magic: At the World of Magic show, you will get to enjoy all the latest illusions, songs and comedy from the park's resident entertainers. Shake, Rattle and Roll: For a short period in the '50s and '60s, performers such as Elvis Presley and Jerry Lee Lewis rocked the world. This show is a tribute to these performers, as well as other musical geniuses of that era. Additionally, a number of musical acts take the stage at Frontier City each year, with past performers including Eddie Money, Reliant K, Kansas, and Christian performers, among other headliners. All performances are free with park admission. Hungry guests can dine on pretzels, hot dogs, hamburgers, chicken strips, and pizza, as well as French fries, nachos, ice cream, and more. Dippin' Dots sells ice cold drinks throughout the park, and guests can also buy ice cold beer at such western style saloons as Tin Lizzy's Pump House. Frontier City is open weekends from March 31 through the end of May, and then daily beginning June 2 through August. The park continues to operate on weekends in September and October. General admission tickets are $26.99 if you order online and $34.99 if you buy at the main gate. Children two and under are always free. The Double Park Season Pass is a great value at $69.99 and includes admission to both White Water Bay and Frontier City. Prices increase after early June. Best Western Plus Saddleback Inn and Conference Center: The Best Western has a Stay and Play package that includes a free ticket to Frontier City and breakfast. Frontier City is a 25-minute drive away. Costs from $124.95. Knights Inn: For $79, Knights Inn provides you with tickets to Frontier City and a continental breakfast. Somehow, amidst competition from such better known theme parks as Busch Gardens, Frontier City still manages to attract a great number of visitors each year. Few would say they come for its roller coasters or the variety of their attractions, but most would say they come because it is one of the few theme parks where you can experience something truly unique.